Welcome! 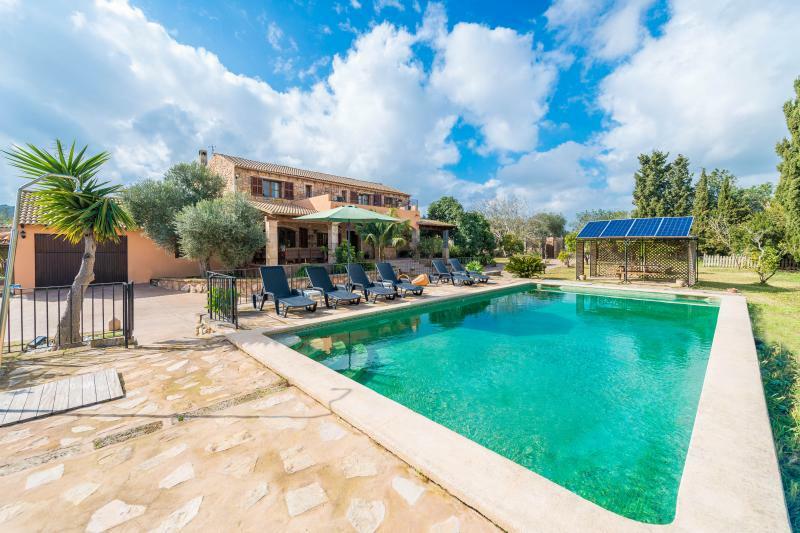 This is a traditional old Majorcan house that has been remodeled. It has swimming pool and it’s located on the outskirts of Petra, at the heart of the island. It’s a 2-storey house of 300 m2 and it counts with 4 double bedrooms, ideal for families or groups of friends. There is one room on the ground floor and is furnished with a double bed. The other rooms are on the first floor: two of them have two single beds and the other one has a double bed. All rooms have closet, air conditioning, heat pump and windows with views to the garden. Every room is comfortable and cozy. Sit down in one of the sofas in the living room and just relax with a glass of wine. A good place as well to enjoy a good book, surf the internet or watch satellite TV. The dining room area is furnished with a nice rustic dining table for 8 people, where you can enjoy delicious meals with family and friends. The kitchen is equipped with everything you might need: toaster, coffee machine, electric oven, vitro ceramic hob, cutlery, kitchen appliances, fridge with freezer and a lot more. Of course you will find as well washing machine, iron and ironing board. 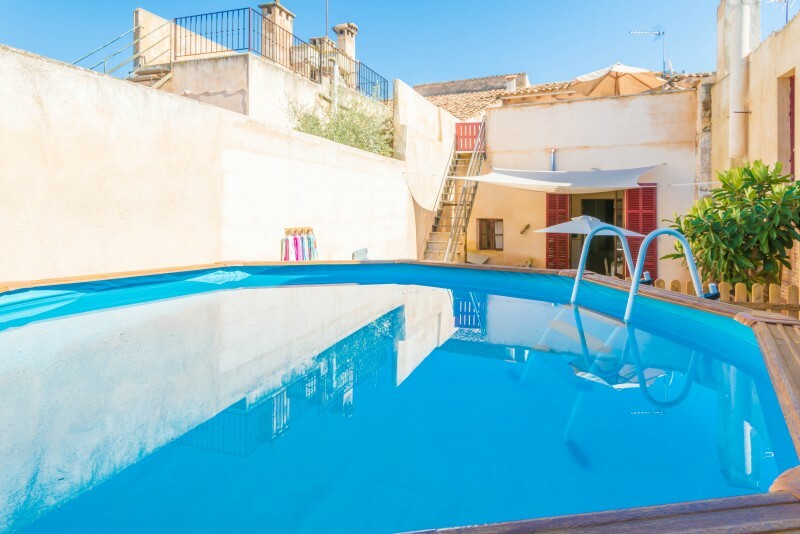 The outside of the house is as well a wonderful place to enjoy your holiday: go to the terrace, have a tempting barbecue, swim in the pool or just relax in the garden. The house is surrounded by 200 m2 terrace and it has different spaces where you can enjoy Mediterranean weather. Next to the pool there is a wooden table and chairs for 8 people. The house has a garden and a 5 x 8 meter private pool well-kept with chlorine with 4 sun beds around. The owners have a vegetable garden where they grow all kind of fruits as watermelon, melon, tomatoes, etc. There are fruit trees as well as apricot, apple, lemon, orange or loquat trees. You can pick them if they are available! 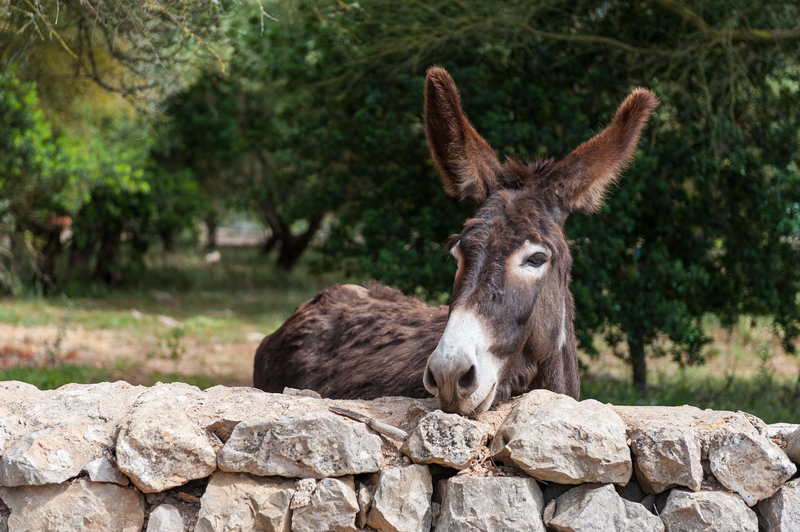 Moreover, the house has a faithful guard: Murta, the donkey, which lives in a corral inside the estate. The house is located in Petra, just in the town limits, which means it’s a very quiet area. At the same time, its proximity to the center allows you to get everything you need during your holiday: supermarket, ATM, pharmacy, sports area, bars and some local restaurants. The train station is close to the house, so that is the only thing you might listen. The nearest beach area, Son Serra de Marina, it’s just 20 minutes drive. You can enjoy a pleasant sunny day in the sandy beach and have a delicious paella for lunch in one of the restaurants with sea views. Make the most of the day and have a cocktail seeing the sunset or why not a romantic dinner in one of the most relaxed and calm environments of the island.